The P325 is the latest in polyester (plastic) strapping tool technology and caters for straps up to 19mm. 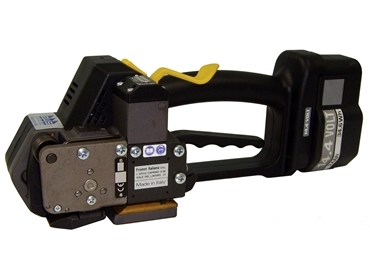 The P325 is specifically designed to dramatically improve mobile strapping applications. The P325 strapping tool are a simple, ergonomically designed, one-handed operation tool. The light frame guarantees user friendliness as well as the ability to strap in all positions. With the P325 strapping tools, it takes one button for tensioning of the strap. This ensures a tight strap every time, without the shoulder straining manual labour of traditional strapping tools. For efficiency, the welding lever of the P325 strapping tools lock in position, which allows for the preparation of the next strap during welding and cooling. Innovations in the strap industry have seen polyester strapping up to 19mm now being used in difficult applications i.e. steel, timber and bricks.